What factors do you consider while shopping for a soundbar? Today, we look at 6 things to know before buying a soundbar for your home. Soundbars are among the most sought-after home audio appliances in the globe. There are many reasons for this. The main one is the amount of space they occupy. Unlike fully-loaded home theater systems, the best soundbars are compact and are ideal especially for the minimalist. Some soundbars come with a separate subwoofer while others have theirs inbuilt. So, a prospective buyer would choose based on their tastes and preferences as well as how they want to set up the living room. The bottom line is that these audio systems will ensure that you get much more entertainment than you would have got from the inbuilt TV speakers. In the current day and age, TV sets are becoming slimmer and sleeker at the expense of speakers. There’s no better feeling than knowing that you are getting the best value for your money. And one way to ensure that this happens is that you get it right before purchasing any item. Regarding size, it depends on whether you want to mount the soundbar or place it on a stand. Also, the length of the soundbar should be in tandem with the TV size. For the whole room’s set up to look good, it should not be too long or too short when placed next to the TV set. If you want to mount it, then any size is acceptable so long as it matches the TV. However, if you want to place it next to the TV on a stand, then it cannot be longer than the stand. Simply measure the TV or stand so that you know how long the soundbar of your choice should be. Alternatively, you can get yourself a soundbase. 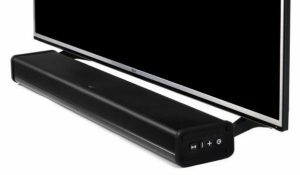 Unlike soundbars, these do not come in the form of a slim long bar. A soundbase is designed to act as a pedestal on which you can place your TV. Wireless streaming has become an essential feature in home audio systems. And Bluetooth technology is the most common and easy-to-use to stream audio. Whether you have an Android, iOS or Windows device, you should be able to stream audio to your soundbar with music apps. Even the cheapest soundbars that cost less than $100 have inbuilt Bluetooth. However, ensure that you countercheck to avoid unwanted surprises. Another way to stream music is using Wi-Fi. A soundbar with Wi-Fi connectivity allows you to play online music using apps such as Spotify and Pandora. A soundbar with a built-in subwoofer or just one external subwoofer is enough to upgrade from your TV speakers. However, that may not really give you the surround experience you can get from a regular home theater system. 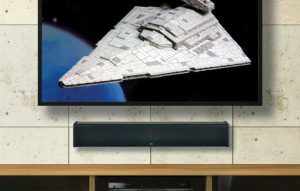 If you want to watch movies like you are in a theater, you need to go for a soundbar that has rear speakers in addition to a separate subwoofer. The Sonos 5.1 Surround Set, for example, gives you a 5.1 channel surround sound. You can connect the soundbar to your TV using an optical cable. However, optical cables are only limited to Stereo, Dolby Digital, and DTS audio formats. The best connection to the TV is using an HDMI or HDMI ARC cable. HDMI cables support more audio formats. These include Stereo, Dolby Atmos, Dolby Digital, Dolby Digital Plus, DTS, and DTS:X. 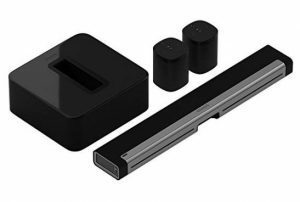 While all soundbars will be an improvement on the built-in TV speakers, cheaper models will most likely be outdone by their more expensive competitors. For example, a soundbar costing around $500 must guarantee an immersive surround sound. The same cannot be expected of a $200 soundbar. Just like when you’re shopping for any other item, you need to be careful not to exceed your budget. Spend within your means or save up for some time until you can afford the soundbar of your choice. Nowadays, most manufacturers provide a standard 1-year warranty. 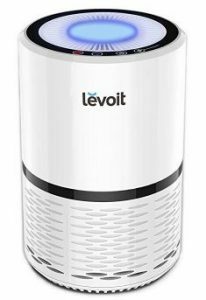 Just be sure to check that this is actually the case with the particular unit you want to buy. It could be pretty disappointing to discover that you have to spend your own money for repairs after a short period of use. The best soundbars in the market will almost always be perfect. However, you need to check a few things before purchasing, as outlined above. For instance, you wouldn’t want to buy a soundbar that is longer than your TV stand; or one that is too long compared to your TV set. Also, you need to spend what you can. We have reviewed soundbars in different categories such as the best soundbars under $300 and those that cost less than 400 dollars.